On a sunny Saturday we made our way to Brooklyn NYC coming from Manhattan. As real Dutchies by bicycle of course. Check out the GoPro video we made crossing the Brooklyn Bridge accompanied by music of Grandmaster Flash. Going around on a bicycle in NYC is simply great. You get much better views on the city and it’s an easy town to cycle. More and more New Yorker discover the advantages of cycling. It’s fast, clean and you get a free work-out at the same time. Our main target was Kings County Distillery located on the Brooklyn Navy Yard in the former Paymaster Building. The Brooklyn Navy Yard is located between the Brooklyn Bridge and Williamsburg bridge and looks out over Manhattan. Kings County Distillery was founded in 2010 by Colin Spoelman and David Haskell. They are also the authors of: The Kings County Distillery Guide to Urban Moonshining: How to make and drink whiskey. A craft distillery, with growing potential. But they are not in a rush, as Colin stated to us. Colin guided us around the distillery; we were able to shoot some videofootage before the official tour. 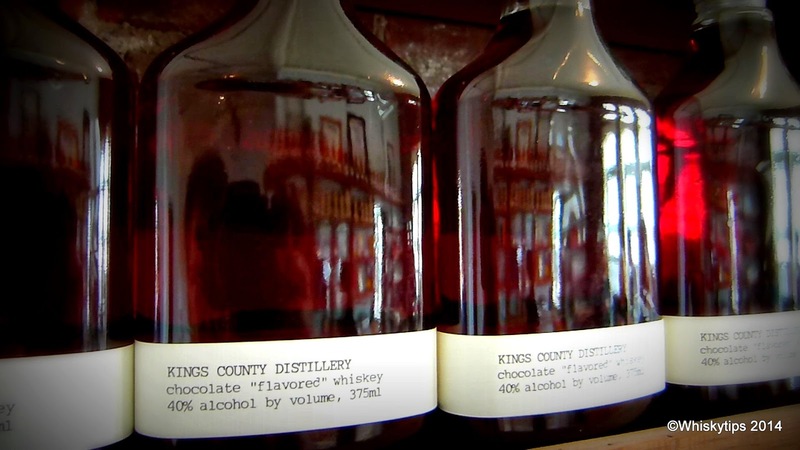 Kings County Distillery offers a range of products, like bourbon and moonshine. Their most remarkable product in our humble opinion the chocolate “flavored” whiskey. It is basically moonshine, infused with ground cacao bean husks from Mast Brothers Chocolate, whose factory is nearby. Without exaggeration this stuff can be put right next to Cointreau or Kahlua, perfect after dinner with a cup of coffee. The bottle we bought was empty even before we left the States. That was a shame, cause this fantastic product is not yet available in the Netherlands. Understandable however, because everyone in the States wants it. Anyway, we urge Dutch importers to get their hands on a few cases, we will order 6 bottles in advance thank you. And Colin, please do pop over to introduce your products on one of the whisky festivals over here. We'll help you out! Conclusion: This is going to be a major hit, no doubt. One more reason to go back to NYC..